Animana 3.11 contains several new features and enhancements to improve the overall usability of Animana, including a new autocomplete feature to make it easier to locate and assign users in the diary and tasks, and the ability to send longer text messages. In this release we’ve also made it easier to see payment descriptions in the client file and payment tabs, introduced auto-filtering to make the Debtors and Uninvoiced pages directly display the current location, and added a new option to export the audit log as a .csv file. To help reduce the time you spend scrolling through lists looking for your colleagues, we’ve begun introducing autocomplete fields to several areas of Animana. In the 3.11 release, this will include the diary and tasks. When assigning a task or creating an appointment, just start typing in the ‘assign to’ field and you’ll see a list of autocomplete suggestions appear below the field, like in the screenshot below. We will continue to add more autocomplete fields to different areas of Animana in future releases. In this day and age, text messages are an effective form of communication. We recognize the need to be able to send useful and clear messages to your customers. That’s why we’ve included the ability to create and send longer text messages in Animana 3.11. You will now be able to send messages of up to 1377 characters (equivalent to 9 SMS) at a time in a single long text message. A character count will appear below the text input box to help you judge how many SMS are included in a given message. You can also view the page Extra > Mailing > Overview Sent Text Messages for an overview of sent text messages and a total count of SMS charged per message. Note that these character limits apply to most of the characters you use to send your daily reminders, but that use of certain special characters will cause the total limit to be reduced to 603 characters. For more information on this feature and details around billing, see our Knowledge Base article on text messaging. In Animana 3.11, it’s much easier to see which users have taken which payments, as well as to view payment descriptions. To help you maintain a better overview of your clinic’s payments, we’ve added usernames and user codes to several areas of Animana that deal with tracking of payments, such as in the Client File, Day Overview, and Balance Cash/Bank menus. For each payment processed by a particular user, that user’s code will appear next to the payment, as in the screenshot below. Note that you will need to assign user codes in Settings > General Settings > User Management in order for these codes to appear. Only users with admin rights or full financial access will be able to change the user code associated with a payment. For more information, see our Knowledge Base article on tracking processed payments. Another measure we’ve taken in 3.11 to give you a better overview of payments is displaying payment descriptions in more areas of Animana. When you add descriptions to payments, the payment description will now appear in the client file when the ‘payment’ tick-box is ticked, as well as in the payment tab of the invoice, as in the screenshot below. Need a refresher on taking and managing payments? Check our Knowledge Base articles on how to process payments while creating an invoice and how to process payments on existing invoices. Just like with payments, user codes have been added to tasks in 3.11. Now when you see a personal or general task, it will include the user code of the user who generated the task, as well as the date and time it was created, as shown in the screenshot below. 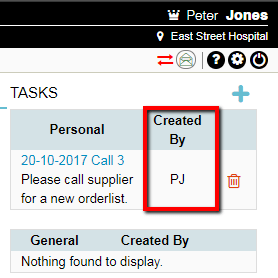 Tasks can be sorted in several new ways, including the fields ‘type’, ‘date’ and ‘created by’. Note: In a patch release soon after 3.11, we will add a ‘created on’ column and filtering, so that you can also filter on columns. Look out for that change coming soon! To learn more about how to create and manage tasks, see our Knowledge Base article about creating and managing tasks. When you view the Debtors or Uninvoiced pages, they will automatically filter to the location you’re currently logged into, rather than loading all entries from all locations at once. This will help improve efficiency by limiting the amount of data displayed on the page at once, giving you more control over which data is loaded first. Of course you can still manually change the view to display other locations as needed by clicking the ‘filter location’ field on the Uninvoiced page or the ‘invoice location’ field on the Debtors page. For admin users: Now when you view the audit log file, you’ll see an additional option that allows you to download as a .csv file. For more information, see our Knowledge Base article on exporting an audit log. 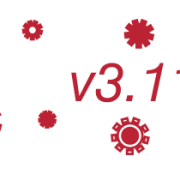 We hope you enjoy working with the new features and improvements we’ve introduced in Animana 3.11. If you have any questions about any of the changes in 3.11, never hesitate to check the Knowledge Base or get in touch with Animana Customer Support. Curious to see the latest version of the world’s largest Cloud-based veterinary practice management system? Request your free demonstration of IDEXX Animana today!